Two new 2-mana 2/2s (that's a lot of 2s) were revealed for Warlock and Priest respectively. The two EVIL cards were revealed on an Instagram story by @PlayHearthstone. Apart from the obvious similarities they share, they are completely different: their wording is inconsistent and one of them looks better than the other! 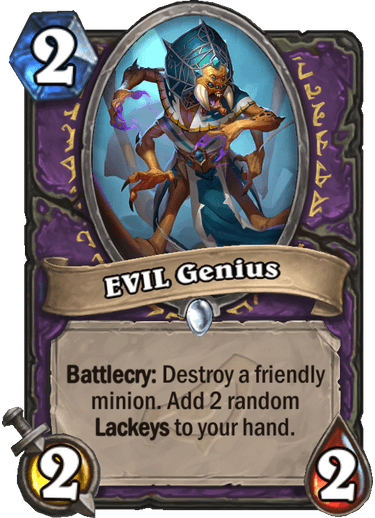 Destroy your own minion(s) to gain a bonus effect hasn't been that good for Zoolock, apart from Grim Rally which does buff the rest of your board. It also remains to be seen how good Lackeys are going to be and if Lackey support cards will be printed. The Genius is probably meant to target Lackeys on the board (they are expendable, after all) to produce other Lackeys. 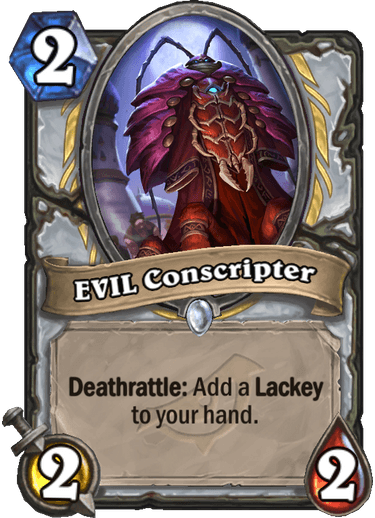 I like this EVIL guy slightly better, since Priest has historically suffered when it comes to the 2-mana slot. However, I am not sure how good Lackeys are going to be in a class that has always thrived on Control. It still a bit unclear to what direction Priest is heading to in Rise of Shadows, since all 3 of its cards that have been revealed so far hearken to pretty standard mechanics/archetypes for Priest (Deathrattle, stealing, Forbidden). Are we going to have exactly one common EVIL minion per class in the League of EVIL, all generating Lackeys? Looks like it. If so, we are still missing the Shaman and Warrior ones. The only non-minion Lackey generator at this point is Warrior's Improve Morale. I guess that we will see more in a near future, possibly one per class as well. I dont think there will be one for class. Lackeys are a part of EVIL scheme, and 4 classes are the good guys. So, there should be one for five EVIL classes, and thats it. Isn't it exactly what I wrote?